02-Nov-2013: 7th ODI against India at Bangalore -- James Faulkner and Clint McKay put on 115 -- Australia's first century stand for the ninth wicket in ODIs. 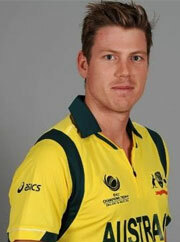 02-Nov-2013: 7th ODI against India at Bangalore -- James Faulkner's 57-ball century is the fastest by an Australian batsman in ODIs, eclipsing Matthew Hayden's 66-ball hundred against South Africa at St. Kitts on March 24, 2007. He became the first Australian number seven batsman to post a hundred in ODIs.